In city environments, the visual clutter of streetlights, phone poles, utility boxes, electric poles and cell phone towers is just something that we’ve learned to accept and, for the most part, ignore. 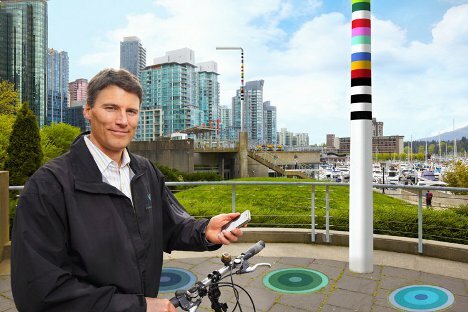 But Vancouver writer and artist Douglas Coupland thinks that our cities deserve better than that, so he’s redesigned the way that urban utilities interact with the urban environment. 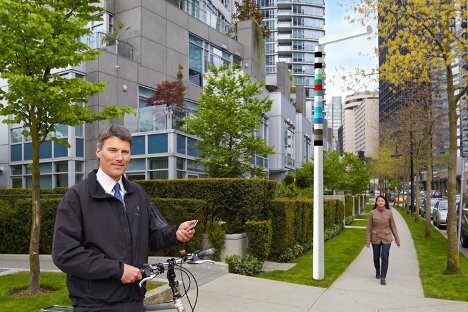 The V-Pole (V for Vancouver, of course) is a surprisingly stylish utility pole encompassing just about everything the modern city dweller needs. Each pole is connected to underground optical wiring. Different utilities can be included in the poles, depending on what is necessary for that area, with modular pieces. Thanks to a new technology developed at Bell Labs, those gigantic utility boxes we are used to seeing can now be replaced by compact devices the size and shape of a Rubik’s cube. That is really the driving technology that allows the V-Pole to squeeze so many utilities into such a small space. 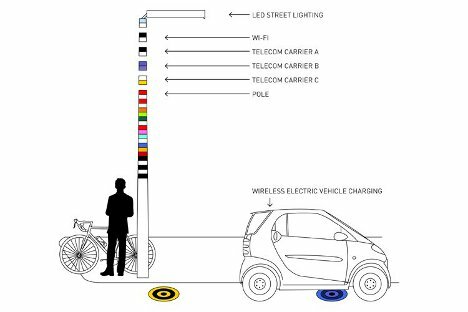 Besides the LED streetlight at the top, a single V-Pole can provide mobile network coverage, wi-fi, electric vehicle charging, parking transactions, and neighborhood bulletin board services. It’s way more energy efficient and and cheaper than current versions of all of these services, and because they are all combined visual clutter is dramatically decreased. Thanks to its modular nature, it will be expandable for future generations. Eventually, we may even be able to forget that urban utilities used to take up so much space in our cities.